View a poster from the Centre for Healthcare Redesign graduation, December 2018. To set a consistent standard for community staff safety for the St Vincent’s Hospital Network, Sydney by December 2019. Reduced emergency department and clinic presentations due to adequate care being provided in the community. Reduced sick leave taken by community staff resulting from incidents of violence and aggression. Reduced turnover of community staff associated with the consequences of incidents of violence and aggression. 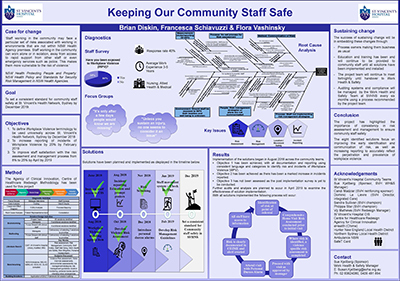 Improved community staff satisfaction with the violence and aggression risk assessment and management process. The clients seen in the community are appropriate and staff safety is ensured throughout service provision. Workplace violence directly affects health provision and can lead to a reduced quality of care provided to patients. Work environments which focus on and support the health, safety, and wellbeing of staff, help to create improved patient and staff outcomes. At St Vincent’s Health Network (SVHN), some community teams have developed local risk assessment and management strategies. However, the process to identify individuals at high risk of violence and aggression is inconsistent across the network, one identified reason being that different teams use different clinical health information systems. Furthermore, staff understanding of what constitutes violence and aggression is inadequate with each clinician’s threshold for violence varying greatly. 42% perceive workplace violence to be part of the job. There are ongoing financial and non-financial costs associated with violence and aggression in the workplace that can have a significant impact on the team involved in patient care. At SVHN the identified financial cost of a staff member seriously assaulted in the community is likely to be no less than $100,000. This includes medical care, associated costs of staffing, human resource involvement, work cover claims, and lost time injuries. Other negative impacts include organizational reputation, and the psychological and physical well-being of the staff member and their respective teams, including motivation and morale. In order to identify the need for the project to be undertaken, an initial staff survey was conducted to understand the current exposure and perception of violence and aggression towards staff working in the community. The results were inconsistent with data from Riskman (incident reporting system) and further exploration regarding the prevalence of workplace violence was required. workshops and in-services for implementation of identified solutions. Following the extensive research and design stage, the following solutions were recommended. Develop violence risk assessment for use across community teams where it is not current practice. Provide unrestricted access across St. Vincent’s clinical information system (CHIME), to ensure staff can obtain collateral from information gathered by all services and disciplines. Develop a universal and reliable system to monitor staff movements and whereabouts. Introduce personal duress alarms for community staff. Develop a risk management process and guidelines. Provide risk screening on all referral, discharge, and transfer of care documentation. Workplace violence to be a standing agenda item at all staff meetings. Education on incident reporting and prompt posters. The following evaluation processes will be executed following implementation to measure the effectiveness, sustainability, and staff use of the proposed solutions. Audit compliance with risk assessment tools. Including recommendations in St Vincent’s Hospital Home Visiting Policy. Handover to work health and safety team for ongoing auditing and monitoring of solutions. Trinkoff AM, Geiger-Brown JM, Caruso CC, et al. Patient Safety and Quality: An Evidence-Based Handbook for Nurses. Rockville: Agency for Health Care Research and Quality; 2008.